Logic+Emotion: Are We Re-wiring Our Brains? Are We Re-wiring Our Brains? A while back, I created a visual titled “Anatomy of the New Creative Mind”. 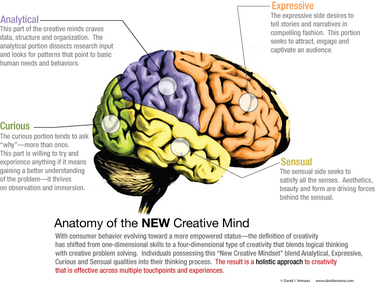 Download creative_mind.pdf I thought it would be interesting to use a “scientific” motif to help make the point that traditional creativity is evolving. My goal was to point out that a multi-disciplinary, multi dimensional way of creative thinking is needed in order to create the kinds of experiences/communications needed to traverse the ever changing digital media landscape. The article goes on to categorize people as either “digital natives” or “digital immigrants”. The core difference is that digital immigrants use much of the same technology—but not in the same ways as the “natives”. In other words, it doesn't come naturally. “Technology is an essential part of my everyday social and academic life. I don’t know where I’d be without it. In fact, I’ve never really been without it. And here is where the rubber hits the road for me. The article concludes that this kind of “evolution” in thinking and behavior is not limited to physical age. This is something that I believe in absolutely. Just as the evolved creative mindset is open to all—so is the choice to engage in emerging media (pending that you have access to it). That’s a pretty accurate way to sum it all up. Rapid digital change is creating a kind of digital class structure—we are either “digital natives” or “digital immigrants” as the article suggests. But I would take the analogy one step further. I think the “digital immigrants” can choose to cling to the old ways and traditions or become digitally acculturated. Those who become digitally acculturated enjoy the best of both worlds—they can still appreciate their traditions while successfully adapting to the ways of the “digital natives”. Likewise, digital natives can learn much from their digital immigrant counterparts. For example, the intricacies of face to face interactions may not come as natural to a digital native and there is something to be said for sitting down with a book—sans iPod, mobile phone and PSP. So in conclusion we don’t really know how this experiment will turn out—but the fact is that it’s an experiment in progress and the impact on human behavior is difficult to ignore. The results will help define how we make connections and build relationships. Because in the end, that is the universal human need.